New engines for updated Alfa Romeo 159 | What Car? 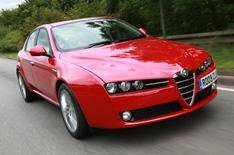 Alfa Romeo has updated its Audi A4 and BMW 3 Series rival, the 159, with new engines and a revised range structure. The updated 159 range includes two new engines, one petrol and one diesel. Alfa says the 1750i 200bhp Turbo petrol engine takes its name from its saloon ancestor, the Alfa Romeo 1750 Berlina. This engine uses variable valve timing and direct-injection technology, along with what Alfa calls 'scavenging', which it says 'allows for maximum exploitation of the turbocharger compared with conventional turbocharged petrol engines'. The result is maximum torque at just 1500 rpm. The other new engine is the 2.0 JTDM 170bhp diesel. This new engine uses the latest common-rail technology and delivers CO2 emissions - for saloon models - of 142g/km. To coincide with the launch of the new engines, the 159 has an updated range structure and now has five trims Turismo, Turismo Sport, Elegante, Lusso and TI. New Turismo Sport trims includes upgrades such as 17-inch sport alloy wheels, Bluetooth, sports seat cloth, sports leather steering wheel and gearknob, and sports dials. Elegante trim also joins the range. On top of the standard equipment that Turismo models have, it adds rear parking sensors, a visibility pack and luxury interior trim. Prices for the Alfa Romeo 159 start at 19,950 for the 1.9 JTDM 120bhp Eco Turismo saloon and rise to 28,900 for both the 2.4 JTDM 200bhp Qtronic Ti and 3.2 JTS 260bhp TI Sportwagon models.